Voter anxiety centers on public aid, Blaine House hopefuls find. Wherever the candidates for governor go in Maine, they say, one question is likely to follow them. What are you going to do about welfare? “I have never seen anger this intense about anything, with the possible exception of the Vietnam War,” said Eliot Cutler, one of three independent candidates on the ballot. The face of welfare in Maine might be a mother buying cigarettes with her state-issued debit card. It might be an elderly neighbor on the edge of becoming homeless. Both pictures are accurate — and that’s one of the reasons that Maine’s complex system of aid to the poor creates starkly different views of welfare and the people who receive it. With a gubernatorial election coming in between a deep recession and a billion-dollar budget crisis, the topic of public assistance for the poor may be the most emotionally charged issue in the Nov. 2 election. Advocates and critics of the system both throw out statistics to support their views, but it is clear that Maine’s system is facing historic pressures. • More than one in six Mainers — about 18 percent — are receiving public assistance to help pay for food, shelter or other basic needs, according to state data. Most receive food supplements, or food stamps, a federal program that has expanded to record enrollments in Maine and nationwide. 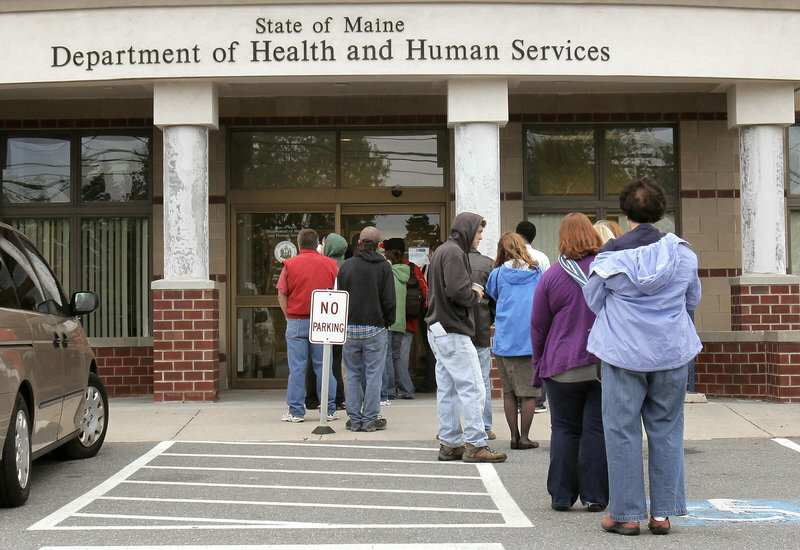 • If you include MaineCare, a government health insurance program, the number of Mainers getting some public assistance jumps to nearly one in three, or 29.7 percent. That’s 391,178 adults and children, state records show. • A record number of Mainers — 56,000 — are counted as unemployed, and more than 150,000 — one in nine — lived below the poverty line last year, according to state and federal data. Long-term trends, including a rapidly aging population, mean pressure on Maine’s welfare system is likely to continue even as the economy recovers. • Government is spending about 45 percent more than it did five years ago to provide food and shelter assistance in Maine. The federal government has paid for three-quarters of the increase. To critics, the growing size of the programs reflects a culture of dependence. “There’s been a massive explosion in the amount of people trapped in Maine’s welfare system,” says Tarren Bragdon, director of the Maine Heritage Policy Center. Defenders say Maine’s poorest people are taking the blame for the state’s financial pain. “(Critics) are somewhat creating an environment of fear, distrust and blame that makes it difficult for us to have a conversation,” said Suzanne McCormick, president of the United Way of Greater Portland. People often define welfare, and those who receive it, by what they see in the checkout line or on the street corner. But while the principle of welfare may be so simple that everyone has an opinion about it, the actual system is a maze of programs that few understand completely. “It’s much more complex than people want to think it is,” said Barbara Van Burgel, director of the Department of Health and Human Services office that oversees public assistance programs. The term “welfare” has come to mean at least two dozen state, federal and local anti-poverty programs, each with its own purpose, rules and costs. The programs include Temporary Assistance for Needy Families, a core national welfare program, and General Assistance, which has been provided in town and city halls across the state since Maine became a state. The “typical” welfare recipient varies, ranging from a child born into poverty in Washington County to an out-of-work truck driver in Portland. A soon-to-be-released University of New England survey of TANF recipients found that the average respondent was a 31-year-old mother with one or two young children. She has had three different jobs in the last five years, and she has received aid for 18 months, according to Maine Equal Justice Partners, a legal aid provider and anti-poverty advocacy group that commissioned the study. The recipients fall into three categories, the group said. Some have lost a job or gone through a divorce and need short-term help. Others lack the education or skills needed to hold a good-paying job and tend to cycle on and off assistance. And, finally, some need longer-term aid because they are disabled or they can’t work because they have a disabled child who needs full-time care. Most TANF recipients are required to look or train for a job, while about 20 percent already have a job, according to the Department of Health and Human Services. If a recipient has a job, he or she receives less benefits. Mainers who receive one form of assistance often get help through multiple programs, most of which are administered by front-line DHHS caseworkers who each monitor 600 to 700 cases. Food supplements are usually the first form of help, and General Assistance is usually the last resort. Much of the aid is now distributed via debit cards. Some aid, such as food supplements, can be used only for certain expenses. TANF aid is a cash grant, on the other hand, and can be used for almost any expense. Defenders of the system see a network of thoughtful programs that are keeping families fed and sheltered in an economy that offers little opportunity. “We as a community have a choice: Do we want to take care of the kids or not?” said Christopher St. John, executive director of the Maine Center for Economic Policy, a liberal think tank. The core state-funded programs that prevent homelessness have stayed lean, even during the recession, advocates say. The number of Mainers receiving TANF dropped by 50 percent from 1994 to 2006. But then the recession pushed the numbers up 6 percent over the past four years, according to state data. “Since welfare reform in 1996, 80,000 families have come into the TANF program, gone off and not come back,” said Brenda Harvey, DHHS commissioner. Maine’s TANF benefits are anything but generous, advocates say. A family of three can get a maximum of $485 a month. The benefit amounts to 58 percent of the average rent for a two-bedroom apartment in Maine, according to the liberal Center for Budget and Policy Priorities, a national advocacy group. If that family also collected the maximum amount of food stamps, the benefits still would put them only at 66 percent of poverty level, the group says. At the same time, St. John and others praised the state for expanding enrollment in the federally funded Supplemental Nutrition Assistance Program, also known as food supplements or food stamps. The number of Maine cases is up 32 percent in the past three years. Along with feeding Mainers through the recession and taking pressure off state and local programs, food supplements are pumping $30 million of federal money into Maine grocery stores each month, he said. “That’s a rational response to a need and a good economic strategy for the state of Maine,” St. John said. Advocates say Maine’s welfare system is proving its value. Maine’s poverty rate remained flat in 2009, even as the recession pushed more families below the poverty level nationwide. “These programs are definitely part of it,” said Chris Hastedt, public policy director for Maine Equal Justice Partners. Critics of the system, however, see a disconnect between Maine’s stable poverty rate and the rapid growth of the aid programs here. They say that Maine’s state government is more focused on handing out benefits than on encouraging hard work and independence. “The purpose of welfare is to move people to self-sufficiency. We’re not doing the purpose of welfare,” said Bragdon, of the Maine Heritage Policy Center. The conservative think tank last month released a report calling Maine the most welfare-dependent state in the nation. There is no definitive way to measure overall dependence, in part because of variations between states. However, Maine does have relatively high enrollment rates in some programs. Maine tied for second with Kentucky for highest percentage of people receiving food stamps in 2008, the latest year available, according to the U.S. Census. Louisiana ranked first. Maine ranked third in the percentage of people enrolled in Medicaid, or MaineCare in 2007, the latest year available, according to the Kaiser Family Foundation. California and Washington, D.C., were first and second. “We’re not more needy than the average state or more poor than the average state. We just have a higher level of dependence,” said Stephen Bowen, the lead researcher of the report. Maine also ranked 10th nationwide in spending on Medicaid and welfare per resident, according to an analysis of U.S. Census data. While defenders say Maine has special challenges, such as high costs and a high rate of disabled citizens, critics point to eligibility rules that are more liberal than other states. Maine is one of 16 states that provide TANF benefits to non-citizen immigrants, for example, and one of nine that doesn’t automatically cut off TANF after a lifetime total of five years, according to the Urban Institute. About 4 percent of cases exceed five years, and most involve a parent or child with a disability, said state officials. “The goal (is): Let’s get as many people on as many programs as possible,” Bowen said. Public assistance should not be used as economic development or to bring more federal funds to the state, the critics said. Even the name of the state division in charge of public assistance benefits suggests the goal is providing access to benefits, not helping families achieve independence, say Bragdon and Bowen. They suggest a new name: Maine EMPOWER, which stands for Employing and Moving People Off Welfare and Encouraging Responsibility. There also is little agreement about the costs of welfare and how much can be saved by reforming the system. Maine could save $360 million a year if it reduces its spending on Medicaid and welfare to the level spent by the average state, says Envision Maine, a centrist think tank. The potential savings is based on an analysis showing Maine to be one of the top five states in spending on Medicaid and welfare as a percentage of personal income, the group said in a report released this month. “We’re really spending an awful lot of money for a state with limited resources,” said Alan Caron, Envision Maine’s founder. Others say the potential savings are much smaller. The primary program that candidates are promising to reform, Temporary Assistance for Needy Families, represents about 1 percent of the state’s general fund. “We’re talking about a sideshow,” St. John said. Medicaid spending is a major part of the state budget and is higher than other states, at least in part because Maine covers low-income adults. Any major cutbacks there could be short-lived, advocates say. Federal law will require all states to adopt eligibility rules similar to Maine’s as part of the health reforms that begin in 2014. Advocates say the entire debate is misplaced. Maine and the candidates for governor should be focused on creating jobs and opportunity, said St. John. But, human nature being what it is, people who are struggling tend to focus on the neighbor who doesn’t seem to be pulling his weight, he said. But critics insist they aren’t blaming the people who receive benefits for the growth of or the flaws in the system.